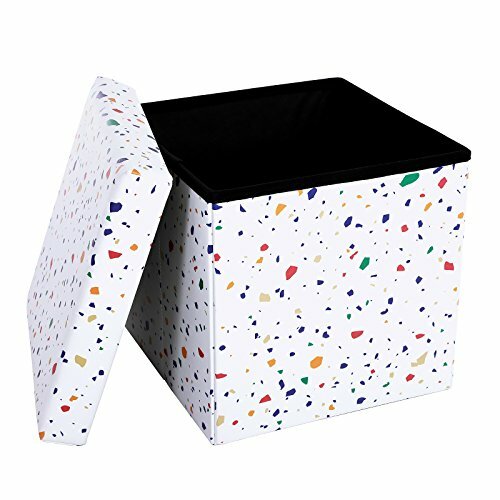 This SONGMICS storage ottoman is finely crafted with superior PU & quality MDF, the after-set-up construction is sturdy & solid, decorative appearance matches your interior decor & furniture. Blankets, cushions, clothes, remotes, books and many other sundries finally have somewhere to go... an easy solution to organize your working and living area. In lack of stools for your guests? With this wonderful combo, it takes only seconds to set up a stool. Tired after a whole day's work? Here comes a nice place to rest your feet on while sitting on the couch. If added with an ottoman tray, it can become a coffee table instantly to hold drinks or foods. We have a variety of folding storage ottomans in multiple sizes and colors, simply search SONGMICS storage ottoman to find more.